I used to love shrimps back in India but the ones that I get here dont have the same flavor. 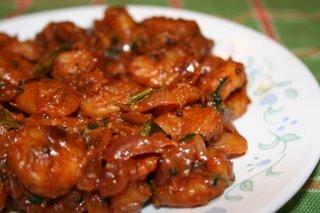 But still once in a while I cook shrimp with a lot of Indian masala to compensate for the lack of flavor. Shrimp also cooks fast hence this recipe is a definite time saver. Wash shrimp and marinate for an hr with chilli powder, coriander powder, turmeric, ginger-garlic paste and lime juice or vinegar. Heat oil in a pan and add mustard, jeera and saunf. Once the jeera starts turning color add chopped onions and fry till they turn golden brown. Add curry leaves, the marinated shrimp and salt and fry in medium heat till the dish turns a little dry (about 15min). Remove from heat and garnish with coriander leaves and serve with rice and sambar. For those who like spicy food, either chilli powder can be increased or dry red chillies can be added along with the onions. Deepz, that's a mouth-watering prawn dish !! Simple recipe too.. Thanks for your recipe, the taste was awesome.